Nature's Secret has combined some of the most powerfully nutritious foods on earth into one amazing formula. The whole-food complexes in Super-Green Super Food supply a wide range of phytonutrients and enzymes to help nourish and vitalize every cell, tissue and organ in your body. Green plants are solar-powered foods that convert sunlight into powerful nutrition. Through the process of photosynthesis, green plants capture light energy (from the sun) and transform it into chemical energy (nutrients) to fuel their growth. When you eat these green plants, you-in turn-absorb these nutrients and use the energy to fuel your body. 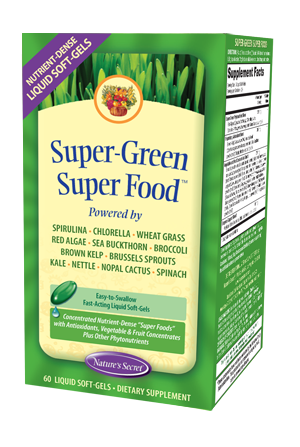 The foundation of this formula is a proprietary Super Green Phytonutrient Blend that delivers a broad-spectrum of concentrated green foods, including spirulina, chlorella, red algae and wheat grass. This formula also delivers a robust blend of concentrated fruits and vegetables, plus and Enzyme Support Blend to assist the breakdown and digestion of super food nutrients found in this formula. Directions: (Adult) Take up to three (3) Liquid Soft-Gels per day with a meal and a full glass of water. May be taken all at once or divided throughout the day. Broccoli powder (leaf), Brussels Sprouts powder (leaf), Carrot (Daucus carota ssp. sativus) powder (root), Kale powder, Onion powder (blub), Spinach powder (leaf), Tomato powder (fruit), Plum Juice powder (fruit), Blueberry (Vaccinium angustifolium) Juice powder (fruit), Cranberry (Vaccinium macrocarpon) Juice powder (fruit), Strawberry (Fragaria spp.) Juice powder (fruit), Apricot Juice powder (fruit), Grape Juice powder (fruit), Orange Juice powder (fruit), Pineapple juice powder (fruit). Other Ingredients: Soy bean oil, gelatin, purified water, glycerin, soy lecithin, beeswax, silicon dioxide, titanium dioxide and sodium copper chlorophyllin. *These statements have not been evaluated by the Food and Drug Administation. This product is not intended to diagnose, treat, cure or prevent any disease.